NEW!!! 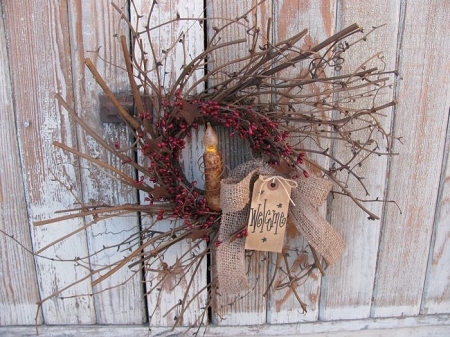 I've taken a spin off of the other wreath I make and gave it a new look. 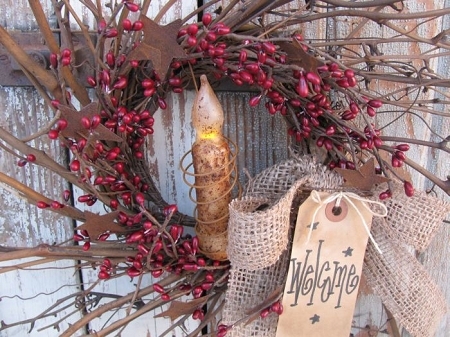 I used the same twiggy grapevine wreath base, added a pip berry wreath with rusty metal stars and a rusty spring with a 4" TIMER candle hanging inside. The candle will work off a timer for 6 hours then off for 18 hours to turn back on the next day at the same time you set it first. Requires (1) AA battery, not included. 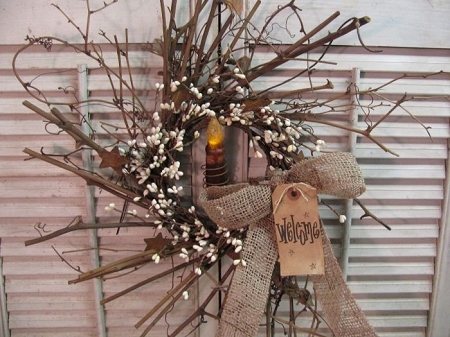 What a welcoming neat look for your front door with the sweet glow of a candle! The candle is the safest though between a storm door and the main door. Not meant for the elements outdoors. There are some choices you can make to customize yours. I have another pip berry wreath option, with cream berries and rusty stars. Also, I can offer different color bows, shown with a NEW option BURLAP. Then the tag greeting. There are a few options there as well. So have fun and customize yours to your liking and I'll make it up for you! 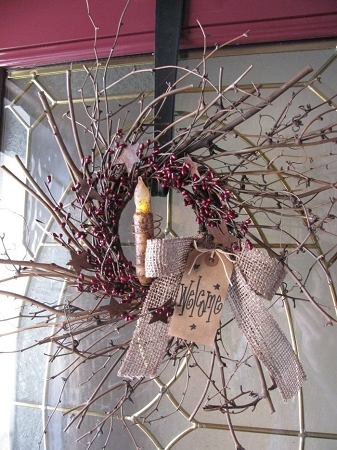 Wreath sizes on average are about 17"-18" in diameter.